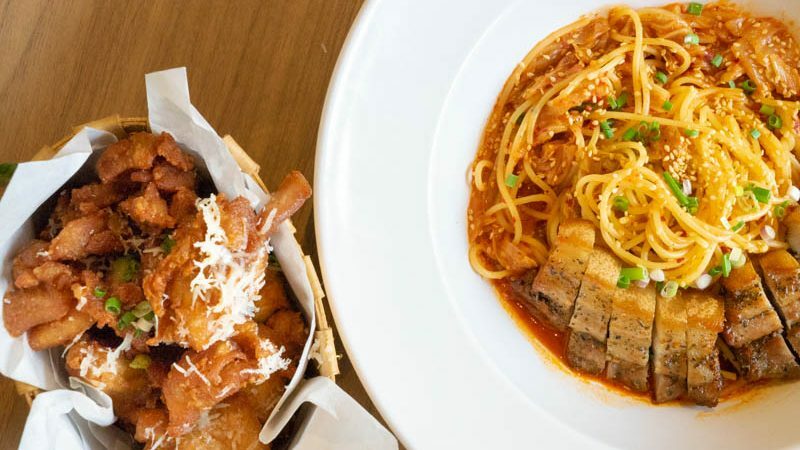 There’s nothing better than discovering new restaurants or cafes that have innovative food ideas, like Spagtacular, which is located just a short walk from Clarke Quay. They don’t just serve regular pasta, they do fusion pasta dishes too, which will bring your taste buds on a spagtacular adventure of flavours. The brightly-lit interior was accompanied by natural light illuminating the space, which made the restaurant comfortable. Spagtacular goes for a rather minimalist look with plain chairs, tables and minimal decorations on the walls. We started the meal with one of the most popular dishes on the menu, the Kimchee Spring (S$15). 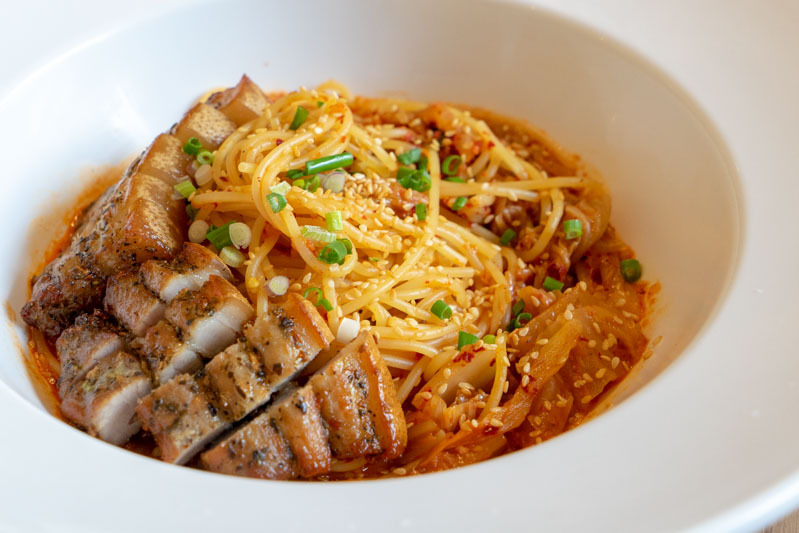 A generous portion of spiced pork belly is served over a bed of kimchi tossed spaghetti, guaranteeing a burst of savoury, spicy and tangy flavours. The first mouthful of the pasta filled my palate with a pronounced tanginess of the kimchi, while the pork belly balanced out the dish with a subtle caramelised sweetness that complemented each other well. You should definitely give this dish a try when you are at Spagtacular. 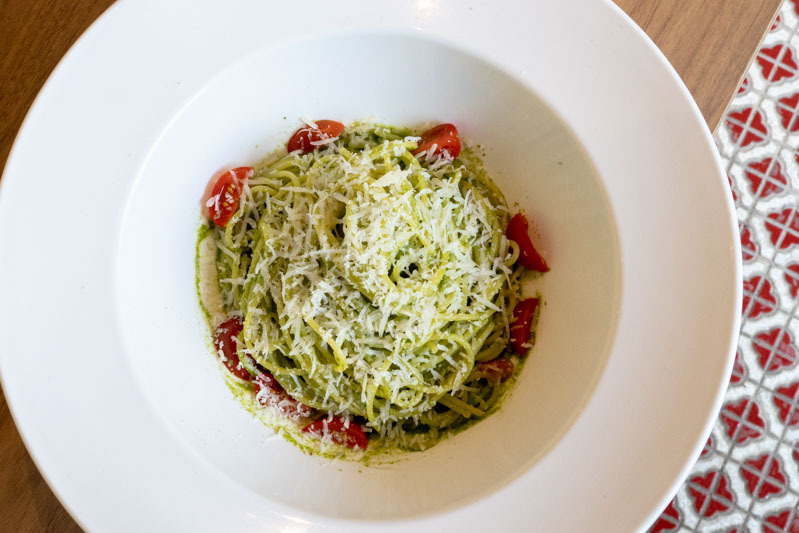 The El Pesto (S$10) is tweaked to cater to the local taste buds as some may find it too herbaceous. If you prefer something lighter on the palate, opt for this. Sadly, the spaghetti was slightly overcooked and the flavours of the pesto were a tad too subtle for my liking, but to each their own. You can also add bacon, prawns or salmon (S$2 – S$4) to amp up the dish. 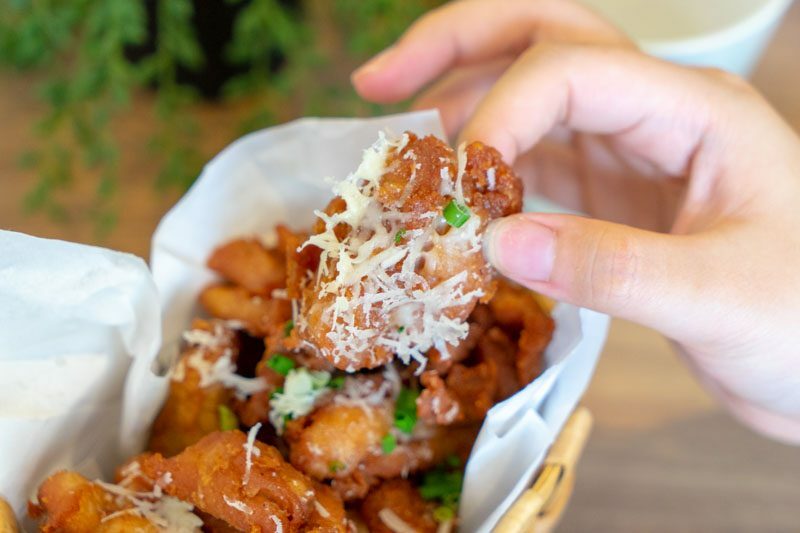 Take a break from pasta and enjoy the meaty Har Jeong Kai Nibblet (S$10). Served in a cute little basket, Spagtacular gave a pretty generous portion of the wings. The fermented shrimp paste marinade added a strong savoury flavour to the crunchy chicken bites. And it’s no wonder it tasted so authentic and rich, because the prawn paste is made in-house. It was so addictive that we just couldn’t stop eating it. 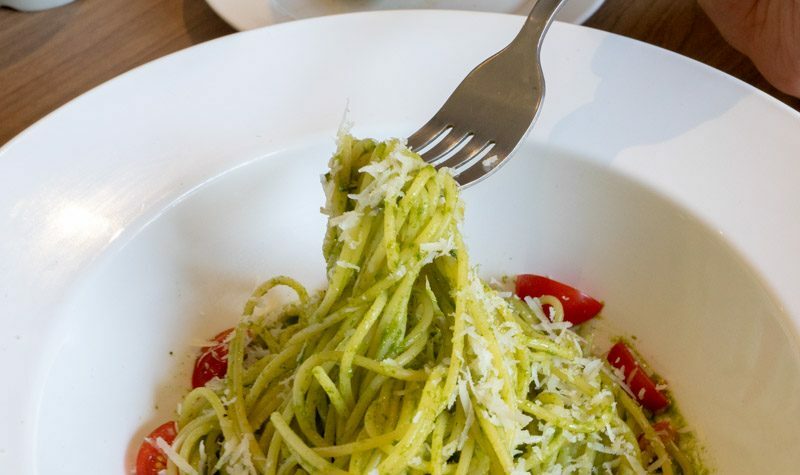 We thought that it went well with the El Pesto pasta, so why not order them together and share with your friends? 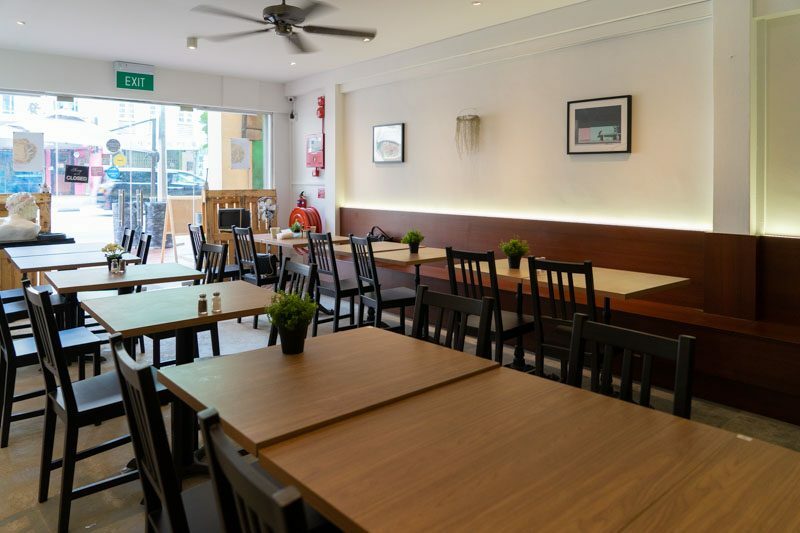 If you don’t try their Mummy’s Assam Pasta (S$15), then you’re missing out for sure. 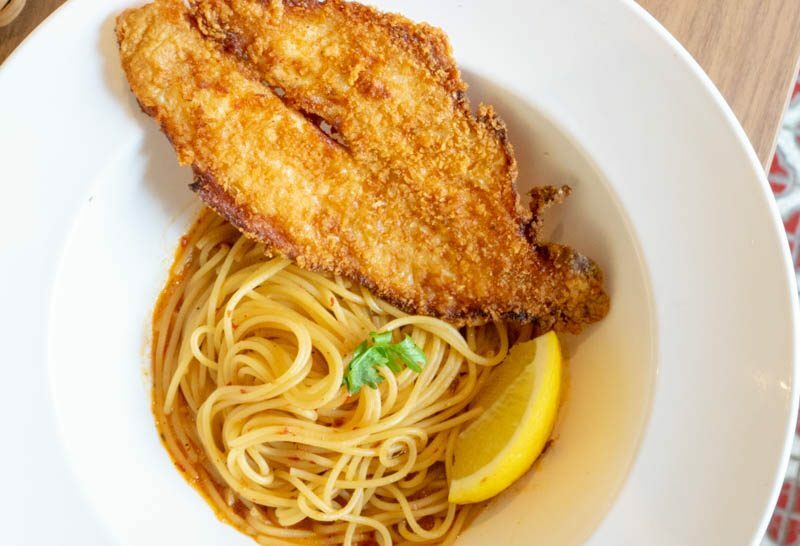 The fried dory fillet filled the air with its mouth-watering aroma, whetting our appetites for another round of delicious pasta. What’s special about this dish is the twist of local flavours; Assam is used to make the pasta sauce, creating a combination of spicy and tangy flavours, which went very well with the slightly sweet fish. 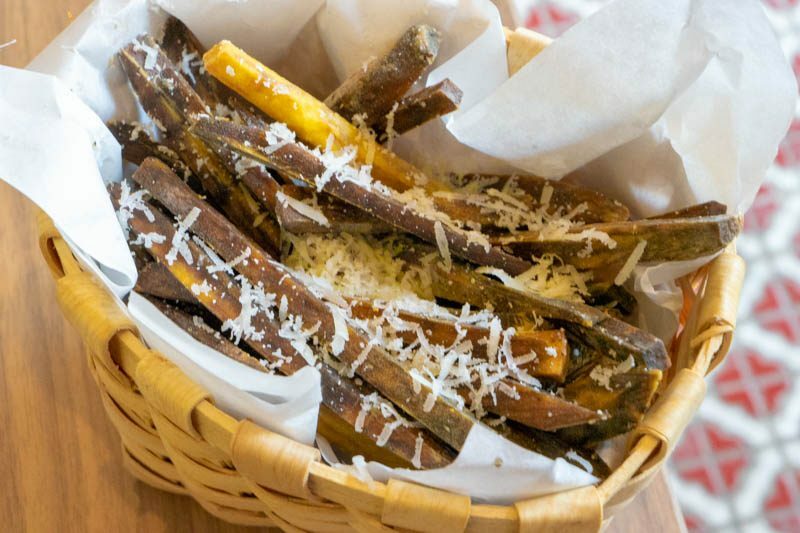 Sweet Potato Fries (S$8) is a must-have item for cafes. But unlike others, Spagtacular doesn’t use the usual orange sweet potato. Instead, they use yellow sweet potatoes, cut into thick strips and seasoned with salt, pepper, and grated cheese. This was almost as irresistible as the Har Jeong Kai Nibblets! However, their sweet potato fries can be a little tough after it cools down, so chow it down as soon as it reaches the table. 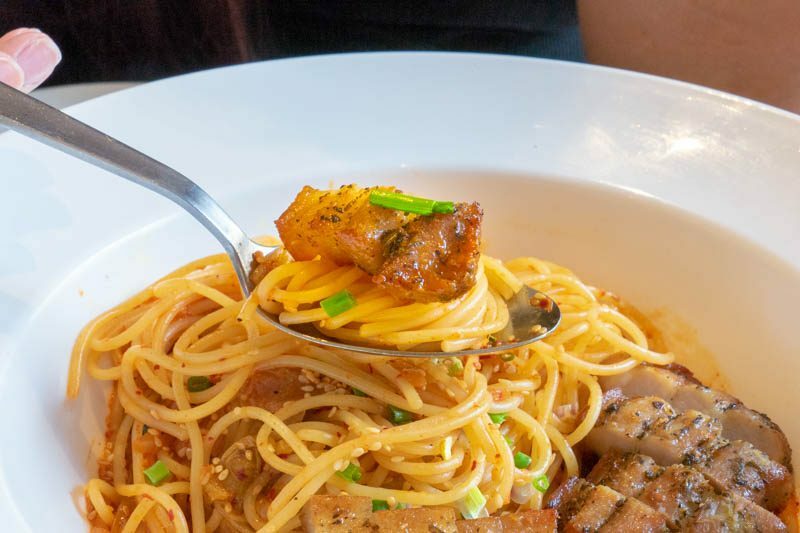 Spagtacular is relatively new in the market and still experimenting with their pasta dishes. So far they’ve done a pretty good job in creating innovative dishes. 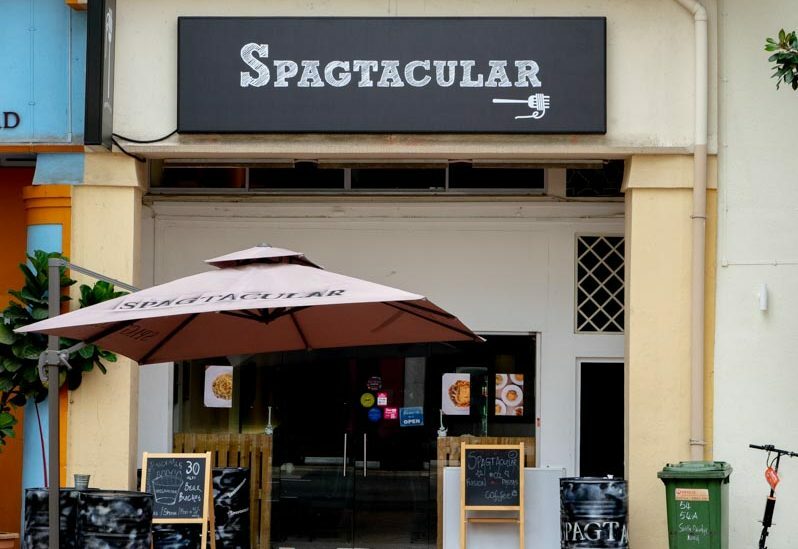 If you’re ever in Clarke Quay and can’t decide on what to eat, why not drop by Spagtacular for a snack or their Mummy’s Assam Pasta! Psst, for those who want vegetarian or gluten-free options, feel free to ask and they’ll try their best to meet your needs.